Discover the beauty of the Simien Mountains with this one week adventure. Our Brilliant local guides know all the hidden gems to get the most out of your time in the 'Roof of Africa'. Easy to incorporate into a longer visit in Ethiopia. Catch a flight from Addis to Gondar. Drive to Michibiny to kick off your adventure with a hike to Sankaber. One way hike to Geech, passing through some stunning viewpoints. Summit Imet Gogo and Inataye. Reach to top of the world as you summit Ethiopia's tallest peak, Ras Dashen. A connecting flight from Addis Ababa gets you in to Gondar, where your local guide will be waiting for you. You'll then head towards Michibiny, situated near the entrance of the Simien Mountains National Park. The drive from Gondar to Michibiny is around 2.5 hours. You'll stop briefly while your guides arrange all the necessary provisions and arrangements for your adventure. Flight Addis Ababa to Gondar. Drive (2.5 hrs) Gondar to Michibiny. Your journey into the mountains begins with a 3 hour hike to Sankaber, your first camp. The hike is gentle and allows you to acclimatise as you're introduced the sensational views of the Simiens. You'll spend the night camping at Sankaber. Today's hike takes you from Sankaber to Geech. En route, you'll likely meet some of the Simien Mountains' famed wildlife, including Gelada Baboons, Klipsringer and Walia Ibex. A highlight of today’s trek is Genbar Falls, a waterfall over a sobering 500m sheer drop, which you’ll see from the opposite side of the ridge. After a break for lunch, you’ll carry on towards Geech, a remote traditional village with thatched roofs. 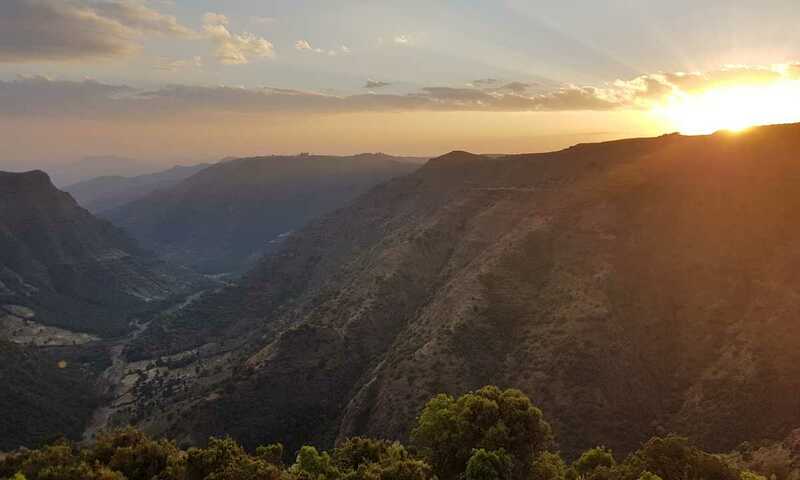 Geech camp is a great spot to watch the sun go down over the range and you’ll often see troops of Gelada baboons climbing down the precipitous slopes to their sleeping quarters in caves in cliffs below. Today is a 7-8 hour trek from Geech to Chennek via the incredible Imet Gogo and Inataye. Imet Gogo, standing at nearly 4000m, affords unbelievable panoramic views of the entire Simien range. If that isn't enough, Iantaye stands at a sobering 4070m. If you can pull yourself away from the views, the remaining trek to Chennek is pleasant. Overnight at Chennek camp. When you can finally tear yourself away from the view, head north east and make for the village of Menteber, where a camp awaits. Today marks your last day in the Simien Mountains. A 7-8 hour trek takes you from Ambiko to Chennek, where you'll spend your final night in the fantastic Simien Mountains. In the morning, your driver will take you from Chennek to Gondar (3.5 hours). Catch a flight from Gondar to Addis Ababa to continue your journey or travel home. Enquire about this module if you'd like to include it as part of a longer itinerary. This trip can run as a group trip, with prices starting from $1,092 per person for a complete group. If you are looking to join a group or you are a solo traveller we will help to form likeminded groups of travellers. Please let us know your travel plans. The current total fare for the domestic flight(s) in the itinerary is USD 140 per person when Ethiopian Airlines is used for international flight. Otherwise the fare for the domestic flight(s) in the itinerary is USD 420 per person. Fares subject to change by airline. Full board, including mineral water. Full camping equipment including tents, mattresses and sleeping bags for camping and trekking. Recommended to bring own sleeping bag.